Friday 23rd September 2016, the Indigenous People Of Biafra (IPOB), will be storming over 100 countries across the 7 continents of the world in demonstration of an unreserved patriotism for Biafra and in demand for the release of her leader, Nnamdi Kanu. Nnamdi Kanu, arrested by the Nigerian State Security Services, DSS, on the 14th of October 2016, has been ordered by the court of law on two different court hearing to be released unconditionally. Yet, against these court orders, the Nigeria's prime Civil Contemnor, Muhammadu Buhari has detained Nnamdi Kanu behind bars and at his unjust discretion. While in this detention, Nnamdi Kanu has suffered torture, health challenges and right abuses by the Nigerian government. To this regards, on the 23rd of September 2016, the Biafran Pace Setters of London, Nation Builders of the United States, our Eagles of Malaga, Cedars of South Africa, Giants of Germany, Fetter Breakers of Italy, Pillars of Manchester, Brave Soldiers of Russia, our Lions in Spain and other valiant men of Biafra will shake the world from its very foundations. The wind will blow across the Atlantic to Malaysia, India and China; it will reach the plain lands of Texas, the serene streets of Canada, the busy roads of Columbia to the ancient cities of Brazil. IPOB, well known for her peaceful approach in her pursuit for the restoration of Biafra, will also in a grand style, pass a message to the world -a message of hope for the blacks, the restoration of the African pride. IPOB is set to expose to the world: the hostilities unleashed on her since she came in contact with Britain, the genocide of 1967-1970, the pogroms in Northern Nigeria, pollution in her lands and waters, and the unjust killings by the Nigerian army (as also reported by Amnesty International). 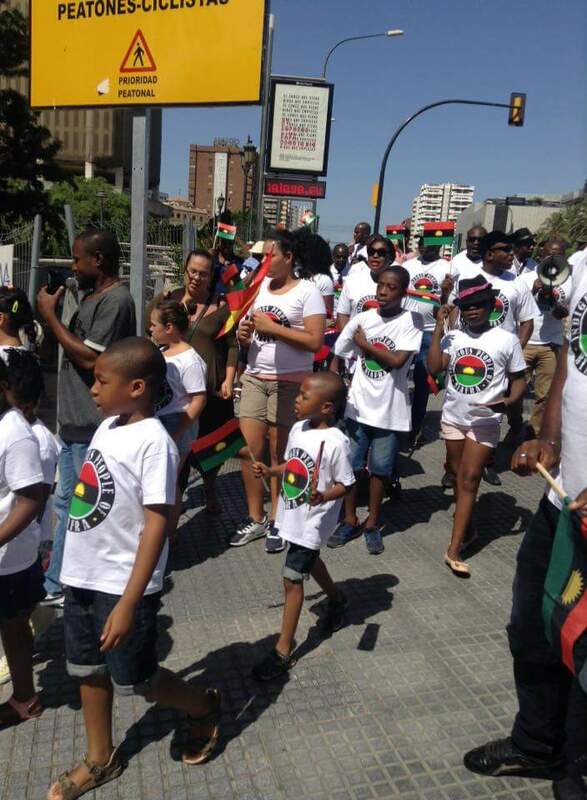 In the Biafran way, we will March across the globe in demand for justice, equity, fairness, rule of law and freedom. The United Nation's Charter for the Indigenous Peoples must be effectual in Nigeria; religious intolerance must give way, unprovoked killings must end and court orders obeyed. On this day (23rd September 2016), our young men shall walk and not faint, our children will inspire the world, our young women shall sing and our elders shall wake and admonish the sleeping world that seems to be untouched with these crimes against Biafrans. We are calling on the world leading media houses, the human rights organisations: United Nations, Amnesty International, Human Rights Watch etc. We call upon all lovers of freedom to join us in this ground-breaking adventure. To Biafrans around the world :- be a part of this history in the making. We have gone too far from where we started from... It is our time, it is our season. This is the least we can do for our nation, Biafra. The blood of our heroes did not stain our soil in vain. This is the story we will tell to our children unborn. It is our role in this struggle. Biafra is for Biafrans and to all lovers of freedom, peace and progress. Nnamdi Kanu has ploughed the grounds for us, he has shown the world that after all -there is a black man that cannot be stained with wants and greed. Every prejudice against Biafra has been dismissed, he has shown that Biafra can attain the greatness it promises. He has done so much to deserve our support. Please check your dates, they are incorrect. Nnamdi was not arrested in 2016.